Over at Sitv.com in the Clips section for The Drop, they have a clip of Jelynn helping to run a MC battle between Golden and Bias. The Drop MC Battles are pretty simple. 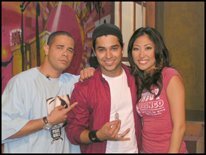 The contestants switch off for two 30-second rounds each and the winner is decided by the audience, or in this case, judges including guests Wilmer Valderrama and F.I.L.T.H.E.E. of The F.I.L.T.H.E.E. Immigrants. You can find this clip by clicking here, or going to Sitv.com/clips, selecting The Drop from the drop-down menu, and choosing the clip titled, "The Drop - MC Battle Golden vs. Bias." It's a pretty large clip (36mb), so be patient if it doesn't start playing right away. Side note: Jelynn took some pictures before the cameras started rolling for this episode and put them on her myspace. Click on the previews to see the full-size versions.